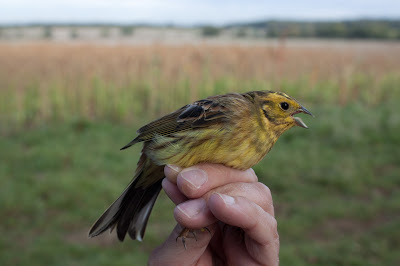 A short session at Market Weston Fen yesterday produced a handful of Reed Buntings, plus an unexpected Moorhen. Unfortunately I'd travelled light out to the ringing site, and didn't have rings for the Moorhen, so it had to go free without its bit of jewellery! This morning I nipped out to do a reccy for the Foraging Farmland Bird Project that's just starting up in Suffolk. 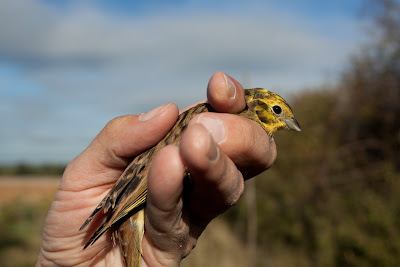 After a bit of a palaver putting nets up at the south end of the farm at Wyken, I soon had a few Yellowhammers in the bag, plus a few other odds and sods. wow....really cute birds... cool .. thanks a lot for showing it to me..